Learn how to develop Apify actors on your local machine in Node.js and push them to the Apify platform using our command line client. If this command fails or prints a lower version than 7.10, please follow official Node.js installation instructions for your operating system. This calls the apify help command, which should output all available commands. Apify command line client to help you create, develop, build and run actors. call    Runs the actor remotely on the Apify platform. create  Creates a new actor project directory from a selected template. info    Displays information about Apify current settings. init    Initializes an actor project in an existing directory. 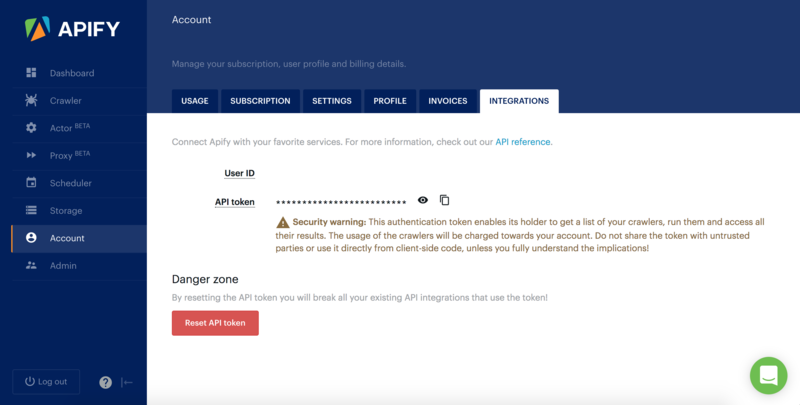 login   Logs in to the Apify platform using the API token. logout  Logs out of the Apify platform. push    Uploads the actor to the Apify platform and builds it there. run     Runs the actor locally in the current directory. That's all you need to create and push your actors from the command line. Let's see next how to use how to use specific commands and how useful they are. The fun starts with command apify create as with that command you can start building your actor. You can start writing actor code just after the command finishes because the tool takes care of all other stuff for local actor development. Let's choose a "Basic" actor in this example, which means that the command creates a new folder named my-new-actor with a folder structure ready for developing actors using some of npm package. This command runs your actor in the current directory. It takes all environment variables that you need for a local run and invokes your actor from the main.js file. It makes sure that all available Apify storages are mocked up locally in the apify_local folder. My test input: Hello world! This command uses your API token and authorizes you with your account. You only have to sign in once because the tool stores your credentials under the ~/.apify folder. To sign up, you need an API token, which you can find on your Apify account page. When you have your API token ready you can call login, which prompts you for it. Info: Deploying actor 'my-actor' to Apify. Success: Actor was deployed to Apify platform and built there. And that's it, your first actor was pushed to Apify! Thanks for reading this article, I hope you found it useful. If you're missing something, you can create an issue on the GitHub repo or contact us through chat.